I just finished reading the Refined by Love book series written by Judith Miller and I ran over here as fast as I could to write my review. I really enjoyed reading this series and was quite sorry when I realized I had read the last page in the final book. The characters were so well developed over these 3 books that I really do feel like I know the family. The author, Judith Miller, did an excellent job of resolving a lot of issues that a reader follows though the entire series. I had initially planned to review all 3 books in this one article. However, once I started writing, I realized that would make this post too long. Therefore, I will be reviewing The Potter's Wife (book 2) and The Artisan's Wife (book 3) in separate posts over the next 2 weeks. 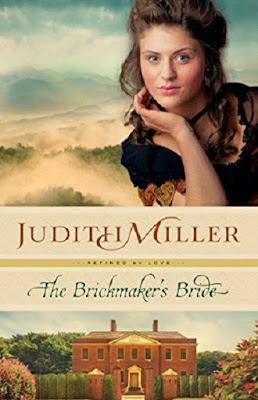 For this post, we shall focus only on The Brickmaker's Bride which is the first book in the series. The title pretty much gives away the romantic side of the plot, but there is so much more to these books than just the romance. Since they are historical fictions, the words paint a picture of what life for immigrants in in the late 1800's might have been like. The Brickmaker's Bride is unique because the immigrants were taken advantage of by Irish family members who brought them to America to work in Uncle Hugh's brickyard. You would think that a family member would look out for their family, but Uncle Hugh prefers to profit off their labor and takes advantage of the needs of his own family. 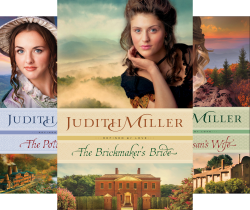 The Brickmaker's Bride (Refined by Love)When Hugh Crothers cheats his way to a small fortune in Ireland, he quickly loads his wife, her sister and his nephew, Ewan, on a boat bound for America. The Irish immigrants have great plans and high hopes for their new home. Because of their background working in brickyards, Hugh decides purchasing a brickyard would be their best investment. Ewan agrees to help him establish the brickyard with the understanding that they will bring his sisters to America as soon as they have the funds and that Uncle Hugh will make him a partner once the brickyard is profitable. Hugh purchases Woodfield Brickworks from Mrs. Woodfield and her daughter Laura, who worked in the brickyard office for her father. When Mr. Woodfield did not return from war, it was necessary for the women to sell the brickworks and few people had the capital to purchase the business. Winston Hawkins, an attorney with political aspirations that happens to be courting Laura Woodfield, serves as the intermediary between the Woodfields, the bank, and Crothers. From the very beginning, Uncle Hugh tries to take advantage of the women and Ewan finds himself caught in the middle. Almost immediately there is a misunderstanding about the property included in the sale. Uncle Hugh believes the widow's mansion is included, but the house that is included is a smaller home close to the brickyard. It was properly spelled out in the contract, but Hugh still maintains he was cheated and should have been given the mansion for the price he paid. Ewan maintains he should have read the contract, asked questions and even visited the house before signing any papers. But Hugh had been in a hurry to get on with it. It is Ewan's knowledge, honestly and integrity that would make the brickworks successful again with the help of the Woodfield women who are willing to introduce him to all the right people. Neither Hawkins nor Crothers are happy about the alliance being formed between Ewan and the Woodfields. Once the brickyard is operational, more reliable workers are needed. Because it is in his best interest, Uncle Hugh secures a loan from the bank and sends the money back to Ireland for 10 male family members and their families, plus Ewan's sisters to come to America. Once they arrive, they are all put to work, yet they have a huge debt to payoff. Uncle Hugh expects each one of them to pay him back for their passage, plus interest, as well as pay him for their housing. His wife, Margaret, puts a few of the women to work as servants and maids in her new big house. There is much stress and strife as Uncle Hugh and Margaret continue to scheme and take advantage of everyone. There are several additional minor plots developing throughout this book since it is the foundation for the entire series. While it may seem to drag a bit, it is necessary to properly prepare us for the following books. Even though it is necessary to read this book to have the full background of the other two books, I have no desire to spoil this book for you. Therefore, I will conclude this review now and let you read it for yourself. While you won't be surprised by who gets married, you will be shocked by some of the other actions and decisions made throughout this book. Be sure and join me next week for the review of The Potter's Lady and the following week for The Artisan's Wife. Well, already I don't like Uncle Hugh. Imagine taking advantage of your own family just to secure profits for yourself. Now you've whet my appetite for seeing how this will all play out in the next two books in the series. Very interesting book review, Sylvestermouse. Thank you. I agree with Elf. Uncle Hugh is a despicable character. Ewan is probably the one who will resolve things for everyone's good. I hope he will. Sounds like a worthwhile read. This sounds like a book I would enjoy! It's on my to read list. Thanks for a fascinating review. This sounds like a perfect choice for my to-read list and my upcoming vacation time! Thank you for the review! Lots going on in this series! I love getting to know an entire family in a really good book series and this, from the first paragraph of your excellent review, certainly sounds like it qualifies. Historical Romance and a nasty uncle, sounds like a great story waiting to be read by me. Thanks for another great review. I will add this to my list!